The road north leads through a small fishing town Vale dos Homens. At the fish market we buy several doradas for dinner. This is a peaceful place, people rarely appear on the streets. We meet an old man sitting on a wooden bench in the shade of acacia lazily reading a newspaper. 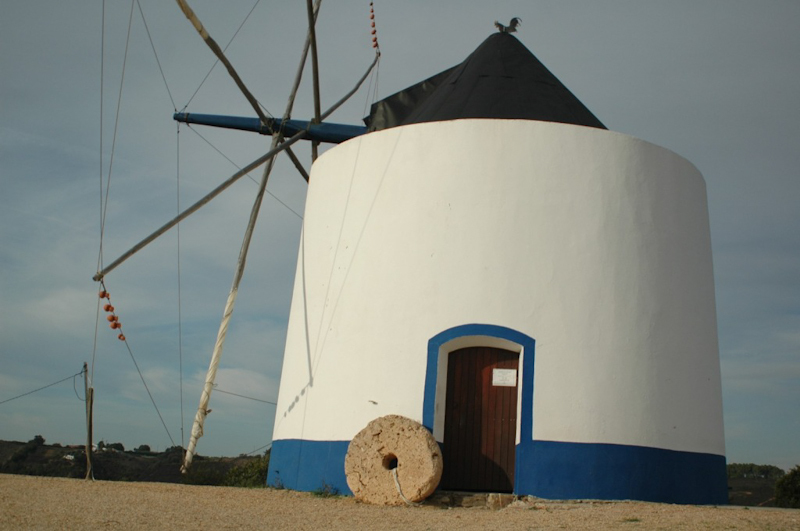 One blue-white colored windmill is nowadays a showcase, a pride and a major tourist destination of Odeceixe. Nonetheless, this is yet another sleepy town. Plate with opening hours does not mean anything. There is no one who looks like letting two lost souls in. excluding a few locals on the street talking idly and dispassionately this is a truly static setting. Preparation and gutting the fish absorb the time and accidentally we miss the sunset. The sky is already filled with thousands of stars. A feeling of staying in pristine locations accompanies us all the time. The civilization is only on demand. Vilanova de Milfontes is a neat town and unlike the other towns is inhabited by young people and full of life. We visit the ancient Mifontes fortress built in the years 1599-1602. The monument which used to protect against pirates, nowadays is a tourist attraction in the hands of a private investor. 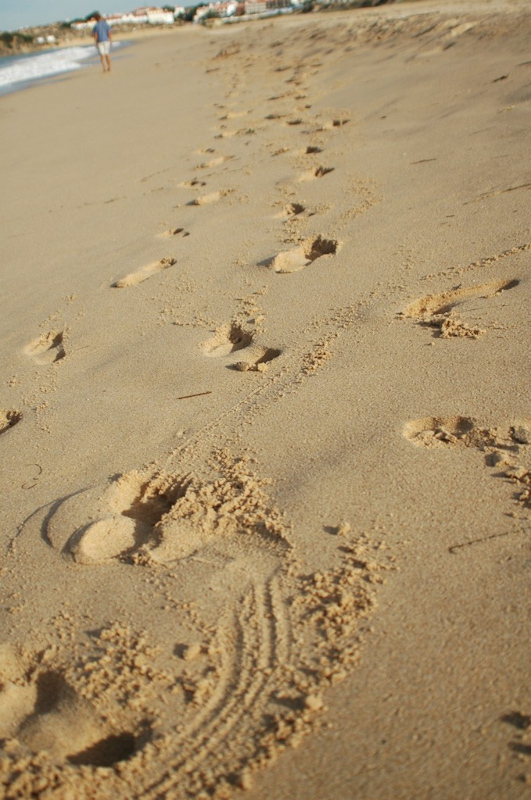 A short walk out of town there is the Praia do Farol, (eng. a beach by the lighthouse), meaning where the barely noticable ‘lighthouse’ looks like a small lantern attached to the building, we admire more than three-meters high waves. The huge mass of water as if in slow motion smashes with a rumble against the water surface. We pass Malhão and close to the Ribeira da Azenha we turn left into a few kilometer long gravel road to arrive at the secluded beach. 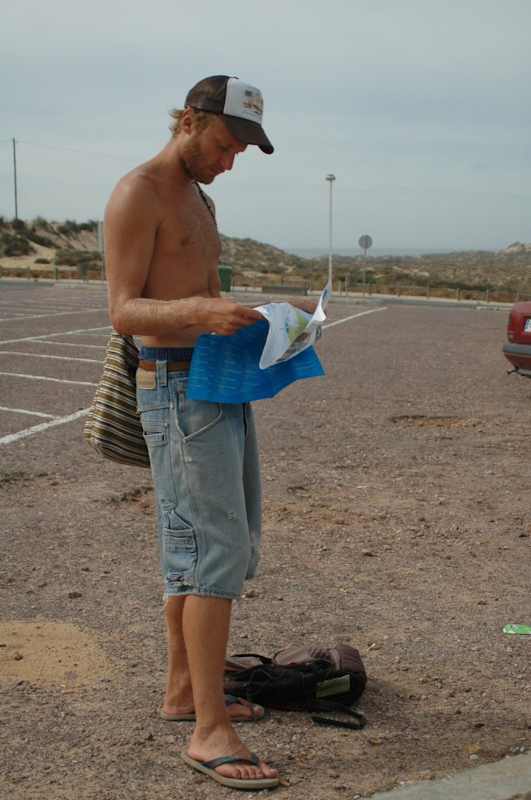 The following days pass searching for similar surfspots. On the way we see lots of cork trees. 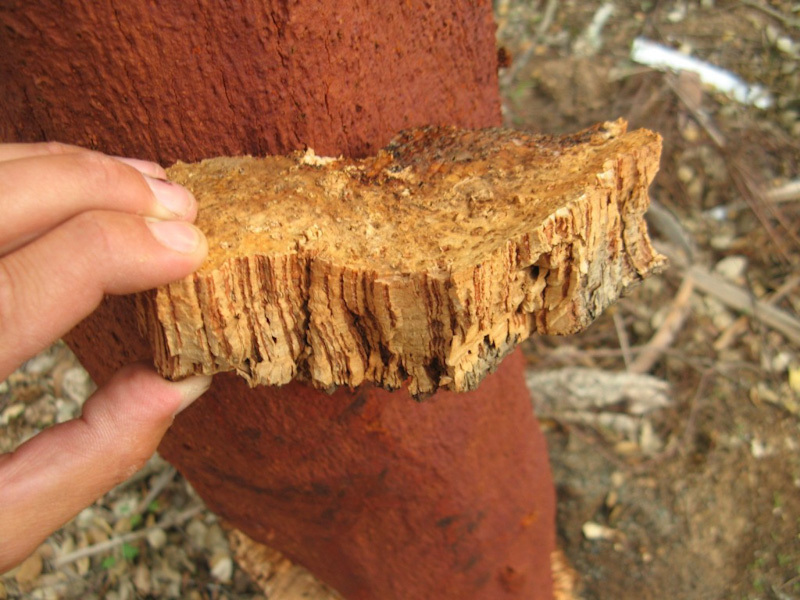 After peeling the thick bark, the core of the tree has an brick-red color. Full recovery, meaning the possibility of collecting the bark once again, takes between nine and twelve years. On average during the life cycle, each tree will produce 12 batches of corks , which are used widely in the local wine cellars. Nature is very practical and it is not an evolutionary coincidence that the cork trees occur where grapes are grown. Port of Sines is a neat town. We visit the museum of Vasco Da Gamma to learn about the great sailor’s travels. Born in Sines and lived in the years 1469-1524 Vasco Da Gamma discovered sea route to India. Thus he established a crucial trade route for the development of contemporary civilizations. His merits gained recognition around the world and in Portugal he is considered a national hero. Evora is a city-monument. The whole citycenter is surrounded by walls. We spend some time walking its streets and getting to know nooks and individual exhibits of this a museum-like city. We take a sit in the central point at Praça do Giraldo. My little chat with a seventy year old toilet caretaker is unsuccessful. Despite my good intentions, I can not understand a word. Maybe it is because he is tipsy, uses the local dialect and cuts the endings of an already barely intelligible Portuguese syllables. It pays to get lost in Evora. We visit a number of green areas, breeding ground for peacocks, we watch numerous buildings and ruins of the buildings. The city has a built in the sixteenth century Aqueduto da Água de Prata, or a ‘silver water aqueduct’. Usable building is almost ten miles long. In its urban parts between the arches some cafes and shops are nicely integrated. We leave the center and come to a nice restaurant Agruta visited by locals. A ticket system queue is used, so we patiently wait. A burly waiter leads us deeply into the restaurant. There is no need to think long before placing an order. We go for a local specialty franga no churrasco com batata frita with vegetable salad and vinaigrette dressing. Our waiter also recommends vinho jarro, a pitcher of domestic red wine in addition to the gigantic portion of chicken and French fries. Shopping. 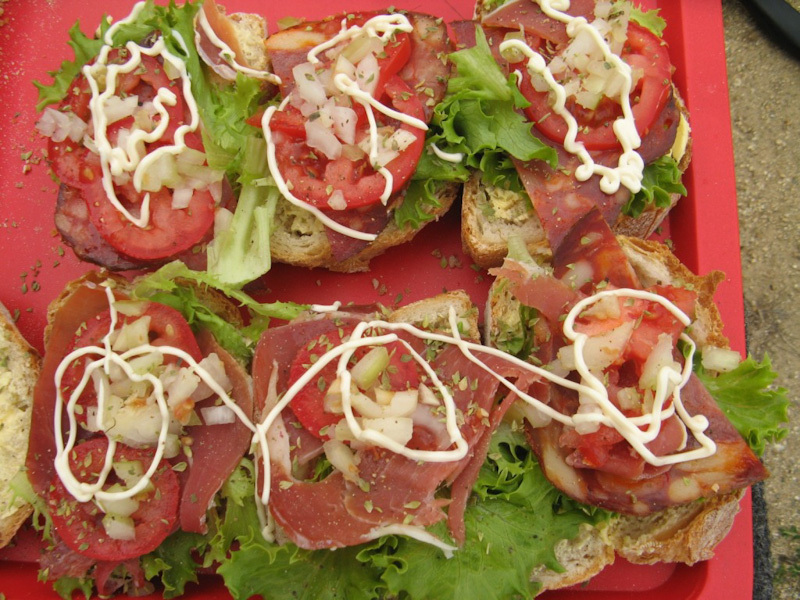 Fragrant baguette, Jamón and chorizzo curado are Portuguese flavors. 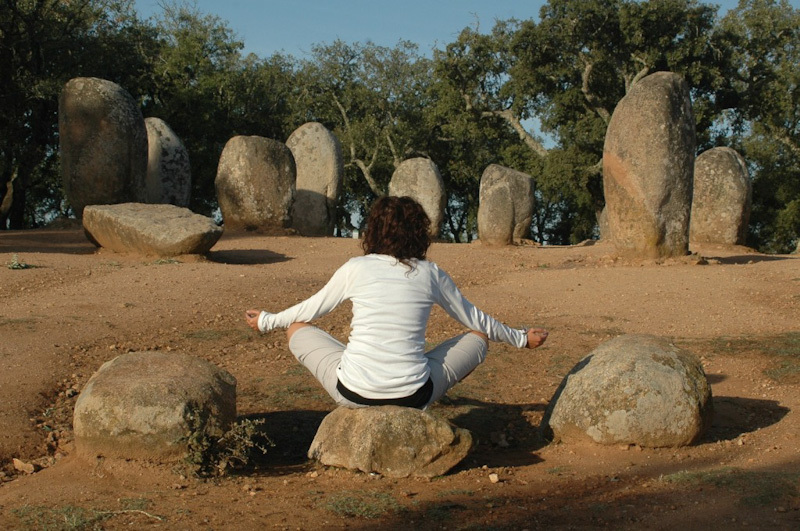 To the west of Evora we find Neolithic monuments dating back to 5000 BC, that is the end of the Stone Age. This place is a nonaccidental arrangement of megaliths, a large boulders of cultic sense and probably also the astronomical importance. These few extra miles bring us to yet another adventure. There is no petrol stations along the way and a fuel gauge has been indicating zero for a long time already. Now it is literally begging for fuel.. There is no miracles and a few miles later we run out of fuel. I manage to drive a few hunder meters further with high speed momentum, which was a pretty wrong decision as now the engine emits a worrying, burning smell. The only thing I can do is to search for a gas station. I take in hand a gallon canister and as people in Africa take their yellow canisters for a trip to fetch water, I set off for a trip to fetch gas. After several attempts to start and lots of grating sounds the Yellow Surfin ‘Bird comes to live again. Once again the limits cease to exist. We continue the journey upnorth.